The complex was refurbished in 2006 and offers a total of 126 apartments distributed over 8 floors. Facilites include a 24-hour reception (salon with satellite TV), currency exchange, 2 lifts, lounges, café, restaurant, bar, laundry facilities and a small children's playground. There is a large swimming pool in the complex, complete with a separate children's swimming pool, poolside snack bar and sun loungers. The complex also offers lovely gardens for guests to enjoy as well as a solarium. Billiards, table tennis and other games are available. Sun loungers and parasols are available for hire on the beach. Opened in 1980, the complex was completely renovated in 1989. There are a total of 150 accommodation options, of which 93 are apartments housed in a 5-storey complex and 57 are bungalows situated towards the rear of the grounds. The complex offers guests a reception desk, a bar, a small supermarket, a lift, a TV room, WiFi with extra charge and restaurant. There is a playground for children as well as a kids' club (for 5 to 12 year olds). In addition, the complex has its own car park. This complex is situated on the well-known Avenida de Tirajana, close to the shopping centre of Playa Ingles. 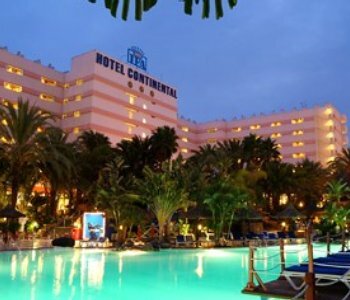 Caserio is a hotel situated a few metres away from the beach in the lively and popular resort Playa del Ingles. Fully equipped with modern facilities the hotel has good public transport links, and good local amenities with restaurants and an extensive variety of shops close by. Caserio offers a restaurant with show-cooking. The area also boasts a vibrant night life with a good selection of pubs and live entertainment shows.